To get young men to fight and die in Cuba for the banksters, it was necessary to persuade Americans – for the first time – that the U.S. military’s duty was not only self-defense, but “righting wrongs” overseas. It was before and during this war that the media honed a skill that would prove perennially useful: manufacturing fake atrocity stories. 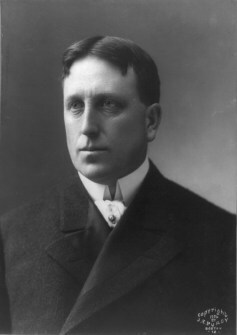 The “Yellow Press,” as it was then appropriately called, was spearheaded by William Randolph Hearst’s New York Journal and Joseph Pulitzer’s New York World. Together they fabricated outlandish atrocity tales about Cuba, such as Spaniards roasting Catholic priests. On October 6, 1896, Hearst’s Journal carried this headline: “CUBANS FED TO SHARKS. Cries Heard at Night – They are Taken Outside the Harbor, and the Silent Ferryman Comes Back Alone.” Pulitzer’s World raved: “RAIDED A HOSPITAL– More than Forty Sick and Wounded Cubans Butchered.” But no hospital even existed in the region the World described. Hearst’s reporters rarely ventured outside Havana’s bars. Some never even traveled beyond Florida, where they forwarded tales spun by Cuban émigrés. And some stories Hearst invented himself in New York. Newspapers could not reproduce photographs then; they published drawings. In a primitive precursor to Photoshopping, Hearst “authenticated” stories with artists’ fabrications. Having money to burn, he hired celebrated painter Frederic Remington. After Remington arrived in Havana in 1897, a famous exchange occurred. Reportedly, he cabled Hearst: “Everything is quiet. There is no trouble. There will be no war. I wish to return.” Hearst replied: “Please remain. You furnish the pictures and I’ll furnish the war.” Although Hearst denied this exchange took place, the words embodied the reality. 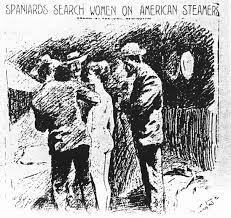 Perhaps Remington’s most infamous illustration: a naked girl surrounded by three Spanish ruffians, under Hearst’s Journal headline: “REFINED YOUNG WOMEN STRIPPED AND SEARCHED BY BRUTAL SPANIARDS WHILE UNDER OUR FLAG.” In reality, a Cuban woman, who had aided revolutionaries, had been searched on a ship by a Spanish matron, in privacy. Remington had not witnessed the event. 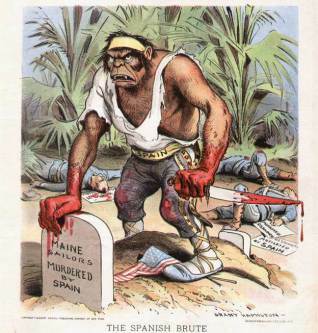 Depictions such as these built up the anti-Spain fervor which exploded along with the Maine in February 1898; America went to war. 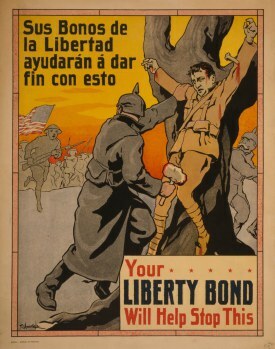 The Illuminati follow the principle “stick with a winner.” What worked to drive Americans into the Spanish-American War would work to embroil them in World War I. And so we went from the Maine to the Lusitania, and from Spaniards roasting Cubans to Germans cutting hands off Belgian children, and other contrived atrocities. 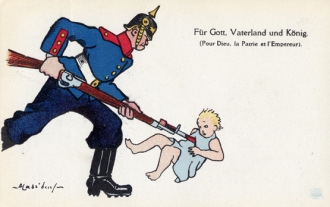 Poster propaganda reached its apex in World War I. 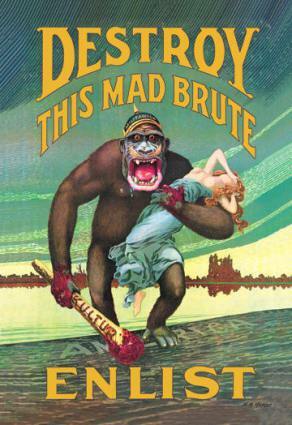 Art was also used to depict the enemy as subhuman (animals are easier to kill). C’mon, boys, look at that Spaniard trample Old Glory! You aren’t going to let him get away with that, are you? Boys, see that damsel in distress? Are you going to let the kraut get away with that? C’mon, boys, are you going to let them get away with that? Between the world wars, radio emerged as a new medium which, behind the bait of entertainment, could pump live propaganda directly into homes. It is possible that Orson Welles’ The War of the Worlds – perhaps the most famous radio broadcast of all time – was intended to gauge public response to fake news. In an eery foreshadowing of today’s faux news and crisis actors, Welles simulated a newscast that “interrupted” a musical program to announce an invasion by Martians. Massive, horrific deaths from the aliens’ weapons were vividly described. 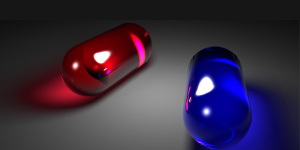 As the “news story” progressively unfolded, “newsmen,” “witnesses,” and government and military “officials” all gave accounts as if the events were real. The broadcast led to widespread panic. Although the program began with a brief explanation that it was fictional, a second disclaimer was not aired until 40 minutes later. The wily Welles knew that many people flipped their radios from station to station (just as they do now with TV). Having missed the first disclaimer, many would assume the news was real. The program aired just one month after the famous “Munich Agreement” of 1938; the pressure for war had accelerated in Illuminist circles, and Americans were about to be inundated with renewed “German invasion” hysteria. If that connection seems a stretch, the original novel The War of the Worlds had been written by arch-Fabian socialist H. G. Wells, who in 1914 published The War that Will End War, which became World War I’s propaganda slogan. And the radio script was written by Howard Koch, who later wrote the screenplay for the most flagrantly pro-Soviet film ever made, Mission to Moscow, which depicted the USSR as a bastion of freedom, and even justified Stalin’s show trials and invasion of Finland. 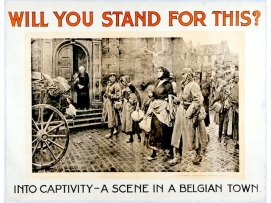 Koch also wrote the script for Sergeant York, the story of a World War I soldier who had been reluctant to enlist but ended up a hero; “coincidentally,” that film was released six weeks before Pearl Harbor. Koch eventually served a stint on the Hollywood blacklist. 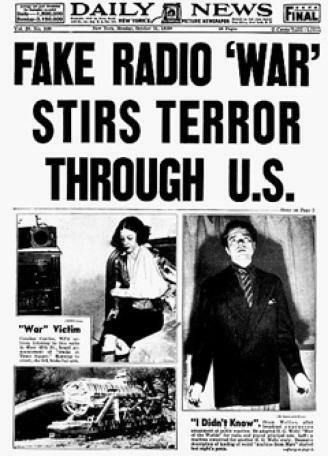 World War II used every propaganda venue: newspapers, radio, movies. Newsprint had come far since the Spanish-American War. Photographs could now be printed, and the public too trustingly assumed that these, unlike Hearst’s drawings and World War I posters, were fake-proof (“seeing is believing”). The “Shanghai baby” went viral in 1937, reportedly seen by 136 million people, and had profound impact on American sentiments favoring China and against Japan. 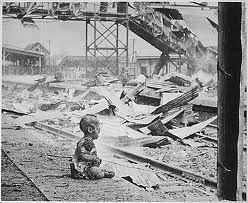 The Japanese, however, charged that the photo was staged, and a number of American journalists, such as Arthur Rothstein, eventually concurred. The photographer, H. S. “Newsreel” Hong, was employed by the Hearst Corporation (“You furnish the pictures and I’ll furnish the war”). Radio fakery continued also. The war’s most famous broadcast was Winston Churchill’s “We Shall Fight Them on the Beaches” speech. However, this stirring oration, like many others credited to Churchill, was actually an impersonation by BBC actor Norman Shelley. The ultimate opinion mover was, of course, movies. 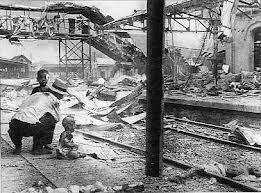 Our Enemy: The Japanese, narrated by Joseph Grew (CFR), described the Japanese as obsessed with world conquest (while the footage showed Japanese harmlessly eating with chopsticks and boarding subways). Hollywood’s vulgar racist stereotypes of the “enemy,” now generally acknowledged, need not be recounted here. 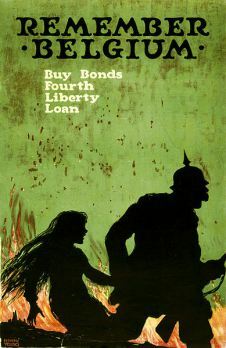 The disastrous Vietnam War, which should not – repeat, not – be confused with other wars, commenced just as TV ownership surpassed 90 percent of American homes. Known as the “first television war,” it was the only war in which the MSM turned its propaganda tools against the U.S. military. The coverage was instrumental in generating the chaotic divisiveness that launched the downward transformation of American culture and values. Of course, the collapse of this 47-story steel frame structure, in 6.6 seconds, even though not hit by a plane, remains extremely controversial. The Kuwaiti incubator hoax demonstrated that, once again, the Illuminati were “sticking with a winner.” The “Belgian children’s hands cut off” and the “Shanghai baby” had proven that baby atrocity stories are a tried-and-true, proven winner in the propaganda marketplace. I am not suggesting that real atrocities do not occur. THEY DO, AND ON A MASSIVE SCALE. But the genuine atrocities are usually censored. If you want to see how a real bombing victim reacts, watch the Iraqi woman starting at 22:05 of this video. In George Orwell’s 1984, televisions continually broadcast fake news in accordance with government wishes. 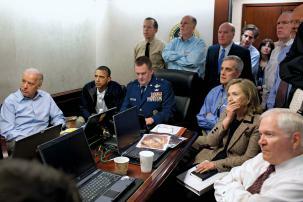 The “death” of Bin Laden on May 2, 2011, marked a major step in this direction. Just 17 days earlier, a Gallup Poll had shown President Obama’s approval ratings at an all-time low. Allegedly Bin Laden headed the world’s largest terror network. If so, capturing him alive should have been top priority, since he would have been a goldmine of information. Instead Bin Laden was reportedly shot dead, and the government immediately proclaimed it had dumped his body into the ocean – guaranteeing the body could never be viewed and its identity verified. 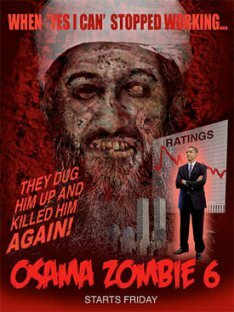 Although “leaked” photos of Bin Laden’s bullet-ridden body quickly surfaced in the press, analysis demonstrated these were old pictures that had been Photoshopped. If those examples aren’t enough, this clip includes more with some repeats. Betsy has also produced a long but insightful video on Boston Marathon bombing notable Carlos Arredondo. Of course, now we have war with ISIS. And public sentiment has been swayed to support it through the usual means: highly publicized atrocities, in this case viral beheading videos, whose authenticity many have challenged. It was only last year that a previous attempt was made to bomb Syria. That was based on a different atrocity claim – that Assad was using chemical weapons on his own people. But many believed it was the Western-backed insurgents themselves who wielded the weapons as a “false flag,” a view thought credible by Ron Paul, Pat Buchanan, and many other responsible observers. The fake testimony of “Syria Danny” had proven unconvincing. Americans overwhelmingly opposed the air strikes Obama sought on Syria. So it was back to the drawing board. 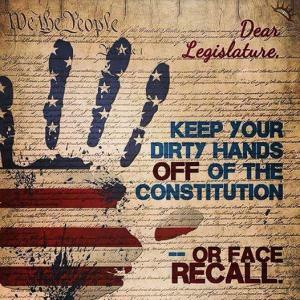 Now we have ISIS beheadings, and Obama has air strikes on Syria. After the first video proved effective on public opinion, more kept appearing. “Stick with a winner”? • unpaid alternative media, whose goal is to discover the truth. My thanks to the many bloggers and investigators whose diligent research provided content for this article.